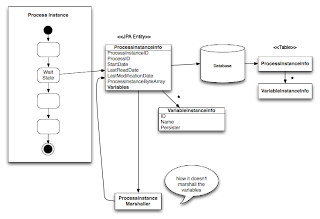 Variable instance data is not stored as part of the runtime state of a process instance, but stored separately as VariableInstanceInfo objects. Different strategies can be used to generate a VariableInstanceInfo that will maintain different information to be able to store and retrieve the external variable information. With these two lines we are configuring two different variable persisters, one for JPA entities and another for any object that implements the java.io.Serializable interface. This new feature will introspect each variable and decide which persister to use to store and retrieve each variable. Now we can start our processes with different variables and they will be handled using the configured persisters. We can see the JPAPersistedVariable "y" that contains the reference to the MyEntity instance, which stores the fully qualified name of the MyEntity class and the ID that can be used to retrieve it from the external database. Now all our variables inserted inside our processes that are instances of the class CustomType will be persisted using the MyCustomTypeVariablePersister. There is only one thing left, we need to create the structure that will contain the specific data for our CustomType variable. This is a very easy step, we just need to create a new VariableInstanceInfo subclass to store only the specific information of our CustomType variable. This will be a new Entity that needs to be mapped into our persistence.xml file. Here I have included an example about how this works that includes configurations for H2 and MySQL to test the behavior and see how the process persists and handles your process information--I encourage you to debug the test--and take a look at the database to see how the variables are persisted. I've also included a simple variable persister to show you a very basic example about how you can wrap a String variable in a relational way to see its content in a VARCHAR field. Please let us know if this has been useful to you and in what way. As always, we welcome you questions, criticism, and (hopefully) compliments.